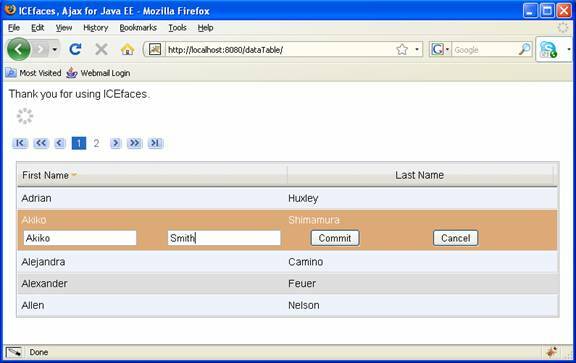 This tutorial will display an editable dataTable using ICEfaces and JPA. All records displayed in the GUI will be lazily loaded. Most importantly, when a record is updated, the ICEfaces rendering api will push updates out to all users currenlty viewing the updated record. The Java Persistence API (JPA), is a Java programming language framework that allows developers to manage relational data inside a Java EE 5 application server or outside an EJB container in a Java Standard Edition (Java SE) 5 application. Many features of third-party persistence frameworks were incorporated into the Java Persistence API, and projects like Hibernate and Open-Source Version TopLink Essentials are now implementations of the Java Persistence API. For this tutorial we use the Hibernate JPA implementation and include notes on any divergence between this implementation and TopLink Essentials. Hibernate allows us to package our database in the tutorial web application using HSQLDB and an import.sql file to populate records. Lazy loading defers initialization of an object to the point when it is required, to make the program operate more efficiently. In the case of a dataTable, although we might bind a list of hundreds if not thousands of records to a component (for instance, an employee list) we only want to retrieve records from the database that the user is currently viewing. Our sample application will use an ICEfaces ice:dataTable component in conjunction with an ice:dataPaginator to display a subset of lazily loaded data in the GUI. Finally, our tutorial dataTable is editable and if we want our users to be informed of record updates, we will have to bring our GUI to life. When a single user updates a record, ICEfaces will push this update out to all other users viewing that record. This is made possible with the ICEfaces rendering api. Inclusion of the hibernate.archive.autodetection property means Hibernate will automatically find our entity classes, the classes do not need to be explicitly listed in this file. The hibernate.hbm2ddl.auto setting results in our in-memory database schema being dropped when the SessionFactory is closed explicitly. To make our in-memory database work, we include an import.sql file in the runtime classpath of Hibernate (this has been available since Hibernate 3.1). After schema export Hibernate will execute the SQL statements contained in the import.sql file. The import.sql file allows us to insert the same 100 records into the in-memory HSQLDB database each time we run the web application. Here is our Customer Entity with JPA annotations detailing the database table and column names associated with the entity properties. The EntityManagerHelper class is used to manage our entities. This is an example of an application managed Entity Manager used outside of an EJB3 container. The CustomerDAO class makes use of the EntityManager to interact with the database. // In the next statement a Hint is required with TopLink to force an update from the database. // This prevents stale data being assigned from the l2 cache when we push updates out from the server. // With Hibernate, we refresh the l1 cache by calling EntityManagerHelper.getEntityManager().clear() in the SessionBean. This concludes the summary of our JPA classes, the bridge between our database and the web application. This is our page, tutorial.jspx. There is nothing out of the ordinary in this page which consists of html, standard jsf and ICEfaces tags. Please review the component showcase or some of the other tutorials for a more thorough understanding of how the components work. The page contains a single column dataTable with a panelGrid of table content and another panelGrid containing the editable row. The editable row is rendered when the table content row has been clicked. The source of this click is the ice:commandLink that nests the content in the row. This decision was made because the editable row contains buttons and input components that should not fire the ice:rowSelector toggleOnClick. As a result, we set the ice:rowSelector toggleOnClick attribute to "false" and use the ice:commandLinks to toggle the rendering of the editable rows. This means the ice:rowSelector component is relegated to applying the appropriate styles to our rows, based on it's bound value. We will now see what happens with the component value bindings and actionListeners in the web application beans. The Customer entity is represented in the GUI by the CustomerBean, a wrapper class with view specific properties and methods. CustomerBean holds the expanded property, which is bound to the ice:rowSelector component and determines when the editable row ice:panelGrid is rendered. The tempcontactfirstname and tempcontactlastname properties are bound to the ice:inputText components in the editable row. CustomerBean also has the methods bound to the actionListeners in the ice:dataTable. The toggleSelected method is called when the ice:commandLinks are used to expand/contract an editable row. The commit and cancel methods are bound to the ice:commandButton components to commit or cancel changes to a particular record. * the Customer details for editing. * changes to the database. The rest of the bindings in tutorial.jspx are to the SessionBean class. SessionBean is our web application controller class that makes calls to the JPA layer to maintain a list of records displayed by a particular user during his/her session. For the ice:commandSortHeader to work, we add the sortAscending and sortColumn attributes to the ice:dataTable component. The ice:dataTable's visible rows are set with a binding to the rows attribute. These bindings are encapsulated in a class called DataSource. SessionBean extends this class. * Is the default sortColumnName direction for the given column "sortAscending" ? * Gets the sortColumnName column. * Sets the sortColumnName column. * Is the sortColumnName sortAscending? * @param sortAscending true for sortAscending sortColumnName, false for descending sortColumnName. There is one more important binding in tutorial.jspx and that is the ice:dataTable value binding. This leads us to the subject of lazy loading and the use of the PagedListDataModel property in the DataSource class. In order to lazily load our dataTable content, we need to create the notion of a DataPage that contains only the records currently displayed in the GUI. This also requires us extending the standard JSF DataModel to work with the DataPage. The next two classes come from WorkingWithLargeTables in the Myfaces Wiki. First, the "page" of data that gets passed back to the GUI. * when returning subsets of available data. * Create an object representing a sublist of a dataset. * of the first element in the data list. * Return the number of items in the full dataset. * element in the list held by this object. * is a continuous subset of the full dataset. The PagedListDataModel, our custom DataModel for lazy loading paginated data. In our case the ice:dataPaginator is used to navigate paginated data bound to the ice:dataTable component. * set of data in memory at once. * current data page held by this object. * a DataPage object that provides info on the full size of the dataset. * number of rows on each page. * fetchData method rather than by explicitly assigning a list. * by getRowData to obtain the objects to render in the table. * number of rows in the current page!). * returned includes the current rowIndex row; see getRowData. // object so that we know the amount of data available. * Return the object corresponding to the current rowIndex. * to retrieve the appropriate page. * required DataPage will be fetched by calling fetchData. * managed bean class to fetch data on demand. The dirtyData property has been added so we can trigger a fetch from outside the paginating mechanisms. For instance, we will need to mark data as dirty and force a fetch in all GUI's viewing an updated record. * Bound to DataTable value in the ui. * returned as a list of CustomerBean objects for display in the UI. // the relative location of the page data. // Calculate indices to be displayed in the ui. // Query database for sorted results. // Remove this Renderable from the existing render groups. // Populate the list of uiCustomerBeans for binding to the dataTable. // Add this Renderable to the new render groups. // Reset the dirtyData flag. // This way, the detached objects are reread from the database. // to clear the l2 cache in CustomerDAO. PersistentFacesState, leaveRenderGroups() and joinRenderGroups() are all related to using the ICEfaces rendering api. A render call will trigger a server push to all users viewing an updated record. The use of this api is our next topic. Renderable: A bean that implements the Renderable interface and associates the bean with a specific PersistentFacesState. Typically, there will be a single Renderable per client. RenderManager: An application-scoped bean that manages all rendering requests through the RenderHub and a set of named GroupAsyncRenderers. GroupAsyncRenderer: Supports rendering of a group of Renderables. GroupAsyncRenderers can support on-demand, interval, and delayed rendering of a group. This tutorial uses OnDemandRenderers. Here is how it works. The RenderManager is an application scope managed bean that the SessionBean has a reference to from faces-config.xml. When a call is made to joinRenderGroups(), the RenderManager is used to retrieve or create an OnDemandRenderer for the specified Customer object (a call to RenderManager.getOnDemandRenderer(String customernumber) will create the OnDemandRenderer if the name is not found). After the OnDemandRenderer is created or retrieved, the SessionBean Renderable is added to the Customer render group. The SessionBean implements Renderable, so its member PersistentFacesState will ensure it receives a push from the server when a render call is made to this render group. After the commit button is pressed in the GUI and a successful update is performed, a render call is made to the updated Customer's render group. At this point getState() will be called on all the Renderables in that group, so we mark the data as dirty in the getState() method to ensure these views will fetch fresh data from the database, before rendering. Please consult the ICEfaces documentation for more information on the rendering api. * database before rendering takes place. * This method is called from faces-config.xml with each new session. // Remove from existing Customer render groups. * Remove this Renderable from existing uiCustomerBeans render groups. * OnDemandRenderers are named/created using the underlying Customer Number. * Add this Renderable to the new uiCustomerBeans render groups. * containing the Customer data so they will be refreshed with the update. * this SessionBean from the list of current sessions. This concludes the tutorial. You may view the source code by following the links below. dataTable-JPA dataTable-JPA source code Connects to an in-memory HSQLDB database through Hibernate JPA. Copyright 2009 ICEsoft Technologies Inc. All rights reserved.